Vernal means springtime, and countries in the Southern hemisphere have opposite seasons to those in the Northern hemisphere. Of course, Easter is not celebrated in September in the Southern hemisphere! Also, almost everyone assumes that "full moon" refers to an astronomical full moon date. An astronomical full moon (AFM) occurs at one instant in time, and therefore occurs on 2 dates around the world (at any instant it is midnight somewhere in the world, with different dates for locales on either "side" of midnight). Again, countries do not celebrate different Easter dates based upon their own full moon dates! Astronomical Full Moons dates are not directly related to Easter dates. Easter is based upon Paschal Full Moon (PFM) dates. This "full moon" does not currently correspond directly to any astronomical event, but is instead the 14th day of a lunar month, determined from tables. It may differ from the date of the actual full moon by up to two days. The date of Easter therefore varies between 22 March and 25 April for those who follow the Gregorian calendar. Eastern Christianity bases its calculations on the Julian calendar, whose 21 March corresponds, during the 21st century, to 3 April in the Gregorian calendar, in which the celebration of Easter therefore varies between 4 April and 8 May. The use of tables instead of actual observations of the full moon is useful and necessary since the full moon may occur on different dates depending where one is in the world. Easter falls from one to seven days after the paschal full moon, so that if the paschal full moon is on Sunday, Easter is the following Sunday. Thus the earliest possible date of Easter is March 22/April 4, while the latest possible date is April 25/May8. The equinox is not related to Easter! March 20/April 2 is the critical date for determining all Easters, and March 20/April 2 was the equinox date in 325 AD when the definition of an Easter date was agreed. 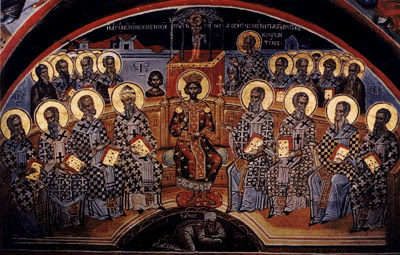 What did the Council of Nicaea rule in 325 concerning the date of Easter? The claim by the Roman Catholic Church in the 1582 papal bull Inter gravissimas, which promulgated the Gregorian calendar, that it restored "the celebration of Easter according to the rules fixed by ... the great ecumenical council of Nicæa" was based on a false claim by Dionysius Exiguus (525) that "we determine the date of Easter Day ... in accordance with the proposal agreed upon by the 318 Fathers of the Church at the Council in Nicaea." The First Council of Nicaea (325) only stated that Easter was to be celebrated by all Christians on the same Sunday—it did not fix any rules to determine which Sunday. In fact, there is no Canon from this Council that speaks of the date of Easter, but according to tradition it was discussed in the minutes, which no longer are extant and cannot be examined. The medieval computus was based on the Alexandrian computus, which was developed by the Church of Alexandria during the first decade of the 4th century using the Alexandrian calendar. The Eastern Roman Empire accepted it shortly after 380 after converting the computus to the Julian calendar. Rome accepted it sometime between the sixth and 9th centuries. The British Isles accepted it during the 7th century except for a few monasteries. Francia (all of Western Europe except Scandinavia (pagan), the British Isles, the Iberian peninsula, and southern Italy) accepted it during the last quarter of the 8th century. The last Celtic monastery to accept it, Iona, did so in 716, whereas the last English monastery to accept it did so in 931. Before these dates other methods were used which resulted in dates for Easter Sunday that sometimes differed by up to five weeks. Easter Sunday is the Sunday following the Paschal Full Moon (PFM) date for the year. In June 325 A.D. astronomers approximated astronomical full moon dates for the Christian church, calling them Ecclesiastical Full Moon (EFM) dates. From 326 A.D. the PFM date has always been the EFM date after March 20/April 2 (which was the equinox date in 325 A.D.). - Easter Sunday date is the Sunday after the Paschal Full Moon (PFM) date. - PFMs are pre-defined dates. - EFMs are approximated astronomical full moon dates, not actual astronomical full moon dates.